Depending on location or placement, your crowd control stanchion take a lot of abuse. Your customers that stand in line step on the bases, unscrew the tops, fingerprint the polished finishes and scratch the surface with their rings or shoes. Your employees are busy and in a hurry, sometimes your stanchions are not handled so delicately leading to dents and more scratches. Other stanchions get cleaned improperly with harsh cleaners or the wrong cloth. this takes its toll on the finish. The list goes on and on. Now you have to make a decision based on your budget. Do you replace the stanchions or look for a stanchion repair shop? In most cases, it is much easier to replace your stanchions as long as you know the brand and model of stanchion you have. In other cases, where you have light scratches or small dents, stanchion repair may be the way to go. Especially if you are dealing with multiple stanchions. Replacement parts such as new bases and finials can add up. 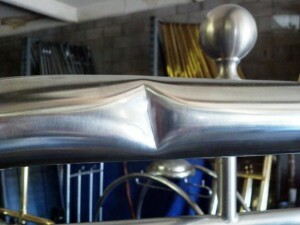 We at Stanchion Masters suggest you contact a local metal restoration, repair or metal polishing shop and get a quote. You will need to factor in replacement parts plus their mark up as well. Then contact us with the brand, model, quantity and shipping destination and let us quote you for new replacement stanchions. We can also have replacement parts shipped directly to you.